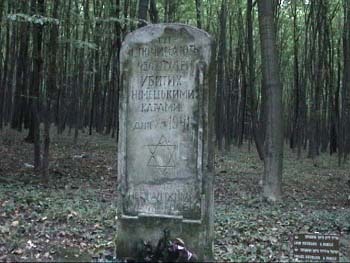 The site commemorates Jews murdered and buried in a mass grave. A pit is seen close to the site of the memorial plaque which Alex Dunai translated as follows: "Here rest 450 people killed by the German murderers on the 27th of July [or August] 1941." The stone marker is crudely written with several errors made. The month is given in Roman numerals and is unclear but it is either July or August. Several sources describe an event that occurred in Buchach at approximately this time. Martin Rudner writes, "In its sweep across Eastern Galicia Einsatzgruppe D recruited local anti-Semites to help round up, terrorize and murder the Jews of Buczacz and other communities. The turn of Buczacz came on 28 July 1941. All Jewish males aged 18 to 50 were summoned to assemble in the square in front of the municipal court house. Some individuals hid themselves. Among those who assembled, several hundred were dismissed, mainly the artisans. About 350 men, mostly the better educated, were taken to Fedor Hill, about two kilometers southeast of the town, and were murdered by gunfire. Among those killed were several members of the newly appointed Judenrat." Elyash Khalfan writes, "The initial attack [on the Jews of Buchach --- TFW] took place on August 23, 1941. The Gestapo ordered the 'registration' (so they called it) of all men between 18 and 50 years old. Over 1,000 men of various ages gathered on the square next to the Judenrat (see Note 1) to wait for the orders of one Koznowski, the commander of the Ukrainian militia. The word of the Ukrainian-German command came at 19:30. The Jews on the square were ordered to arrange themselves in columns in order to march to an unknown destination under the guard of the Ukrainian police assassins. They were marched to the prison yard and there they were pushed together by blows from truncheons and rifle butts. The Gestapo chief, the tyrannical Atmaniuk, began the registration by choosing those men who met his criterion of 'being able to work'; and ordering them to one side. People did not know which side was good and which was bad. Finally, nearly half the persons present were chosen, leaving some 625 men who were among the most outstanding in the community: university teachers, people with higher education, physicians, among whom were some women, young men, etc. They were left under the guard of the Ukrainian killers, who took advantage of the opportunity to rob them of all their valuables. Their families waited for their return all night. Only at 4 in the morning did they learn the terrible truth, which shook the entire town: the 625 men were taken from the prison yard to the Fedor Sosenki forest .... Pits had already been dug there by those of our Christian neighbors who lived nearby. All one could do was to listen to the shots and cries of the dying." Etunia Bauer Katz writes, "... on August 25, 1941, the Gestapo ordered a 'registration'; all men aged eighteen to fifty had to appear at the police station to register no later than 6:00 that evening --- and the penalty for absence was death. ... Four hundred and fifty men ... were shot in the forest of Fedor Hill in the early morning hours of August 26, 1941." Despite the discrepancies among these three sources, it seems pretty clear that this plaque memorializes the first mass killing of Buchach citizens after the German occupation. Etunia Bauer Katz calls the event "The First Rejestracja".